Luxurious Wailea Suite @ Kihei Rates! This adorable Wailea Studio is located at the Grand Champions Villas in the heart of Wailea. New comfortable top of the line TEMPUR-PEDIC / TEMPUR-CLOUD SUPREME king bed. Free Wi Fi internet connection and free long distance calling to US and Canada. 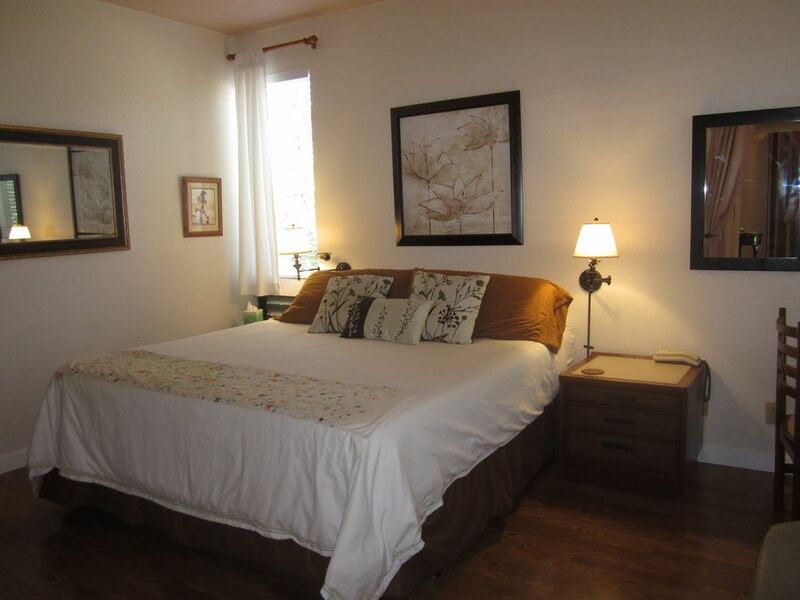 Fully equipped kitchenette, washer/dryer, newly remodeled cabinets and granite counter tops. Free numbered parking stall next to unit with no stairs to climb. Hotel safe to lock up your lap top and precious items when out exploring the Island. The unit is fully equipped with beach gear needed for a fun day at the beach. Owner and manager is on property to help should any problem arise. If you are traveling with a group or just need extra room check out my other Wailea listings below the rate details and availability calendar. This world-class complex features two crystal-clear pools to swim in, two whirlpool spas to relax in, poolside barbeque facilities and georgeous, lush gardens throughout. Grand Champions Villas is surrounded by the award-winning Wailea Old Blue Golf Course and is adjacent to the Wailea Tennis Club. Walking distance to Wailea's Beautiful beaches and spectacular paved walking path that boarders Wailea five star hotels. I first visited Maui in 1977 and made my dream of living in Hawaii in 1986. Wailea has been my home for 31 wonderful years, and I feel fortunate to call Maui my home. I started my rental business when I bought my home in 2002 and have had many happy repeat guests from all over the world. Living on property gives my guests the assurance they will be taken care of should any problem arise. I bought my home at Grand Champions Villas because I had rented in the complex since it was built and believe the complex and it grounds get more beautiful every year. Wailea is NO KA OI!!!!! I love the location. Being able to walk to the Shops at Wailea and the spectacular ocean path for my evening stroll is wonderful. Your own numbered parking stall next to the unit. Blender, kettle, and plastic glasses for pool areas. Cozy dinning table to enjoy your meals. Beach chairs, umbrella, snorkel gear, boogie boards and cooler for a great day at then beach. Hot tubs at both pool areas. Newly renovated, fully equipped studio starting at $130.00 per night. Two night minimum stay. Shorter rentals welcome if they are a fill in at the end or before another booking. $75. cleaning fee for all bookings. Free mid stay maid service for stays of 9 or more nights. Property is surrounded by the Wailea Blue Golf Course and Wailea Tennis Club, just a short stroll to Shops at Wailea with numerous restaurants and coffee shops. Two heated pools and hot tubs with gas b.b.q. 's on property for your enjoyment.